If the Rio Olympics taught us anything, it’s that you definitely don’t want to mess with the gold medal-winning women’s US Gymnastics team. The team, known as the Final Five, are absolutely ripped. 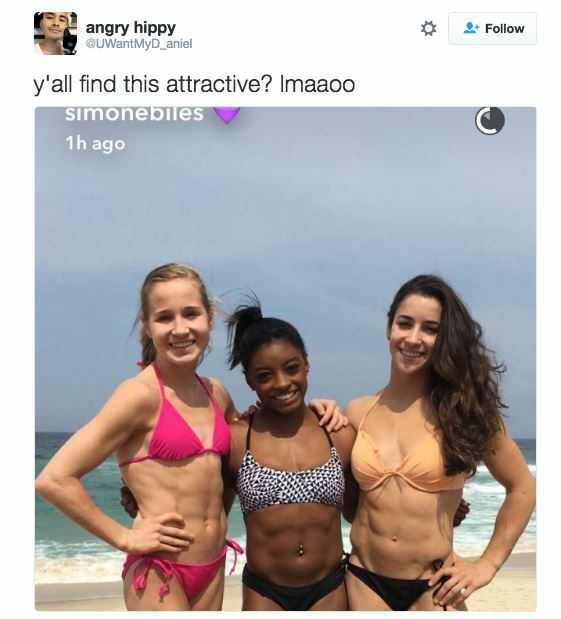 Last week, three of the gymnasts, Simone Biles, Madison Kocian, Aly Raisman, proved this by posting a photo of them and their collective 24 abs on a beach in Rio. With a Twitter handle like his, it’s not entirely surprising he’d make a comment like that. But Twitter, full of Olympic spirit and common decency, jumped in to defend the athletes. These women r some of the most accomplished athletes on ?, but whether they're attractive is the most important quality ??? The team hasn’t commented on the support, but I’m sure they appreciated it. Who cares what body shaming trolls have to say when you have an Olympic gold medal and an eight pack anyway?